Industrial Agitators are what our company is known for. The GMX series of mixers is designed to handle all of your large tank mixing needs in an economical configuration, without sacrificing durability or efficiency. Process and Storage Tanks require industrial agitators of varying levels of “duty”. The GMX Model can be used as an industrial agitator in many large tanks, but typical configurations offer a unique economical solution to large tank mixing. 1 to 5 HP Standard NEMA C-face motors. 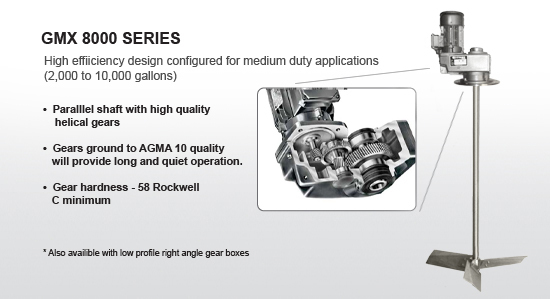 GEARS Minimum Service Factor of 1.5 Ensures continuous operation under heavy loads. MOUNTING Plate/Flange Plate, Flange or Angle Mount, Angle or Offset Mounting configurations available to avoid the need for baffles, and optimize mixing. BEARINGS Deep groove ball bearings Rated L – 10 for life over 50,000 hours. OIL SEALS Quardrillip Seals Protects gearbox from the environment and offers redundant protection of your application from contamination. HOUSING SAE 30 Gray Iron Strong and Rigid. MOUNTING Hollow quill assembly Types include hollow quill coupling for ease of field assembly. IMPELLERS High Efficiency Pitch Bridges the benefits of our P4 Pitch impeller and the low shear of our Dynaflow. The design benefits of this impeller include easy installation and an economical price. *Other impellers also available. machineable metal Carbon Steel, Stainless Steel other Coatings Available.